Bulldogs get back on track in Duluth. Two more weekends left in conference play and UMD may have the most intriguing series since the New Year. Colorado College was picked to be a contender for the top spot in the WCHA and the Bulldogs were a middle of the pack pick. Enter reality. UMD is fighting to stay in the top two of the WCHA, but more importantly trying to find the winning groove that propelled them to 17 games unbeaten earlier in the season. CC is still trying to find their place. Are the Tigers the team that got swept by Bemidji State or the team that won the Gold Pan from rival Denver? Many college seasons come down to goaltending and that is especially true for the Tigers. CC was picked to finish high mostly due to returning goaltending of Joe Howe. Based on Howe’s play this season, the Tigers have needed to create a new plan named Josh Thorimbert. But that wasn’t the answer either, so currently CC is on a rotation that appears to be play one goalie until he melts down, then switch. So UMD isn’t sure who will be in nets for CC, but they do know that the Tigers have been prone to late game brain freeze this season. In their last four games, the Tigers are 1-3-0. They led in all three losses and have been outscored in those third periods 8-0. Truly the game isn’t over until that final buzzer sounds. For UMD to gain momentum in the end of the season, they need to get back to finishing games off strong because the third periods this weekend could make or break the series for the Bulldogs. TUC Problems. Of the top 14 PWR, three have less than 10 wins against Teams Under Consideration (TUC) and UMD is one of the three. The Bulldogs are the highest ranked of the three at #5 and will not move up unless they win the few TUC games they have left. This weekend may be the last weekend before the Final Five that UMD plays a TUC team. UMD’s last opponent, SCSU, is the last team on the TUC list right now. Mores SCSU losses will drop them out of the TUC. The TUC problem stems directly from the conference schedule that UMD has played. The WCHA is down this year and UMD only plays Michigan Tech, Mankato and Alaska – Anchorage four times, all teams that are not TUCs. Picks by Fiskness. The past weekend in the WCHA made for some excellent games and some unexpected outcomes. The Seawolves got a big upset in Saint Cloud only to get whitewashed the following night. Another big surprise was the Badger's Saturday night win over the Denver Pioneers. The Pioneers had been a hot team getting a big Friday night win, however that momentum did not continue into Saturday. 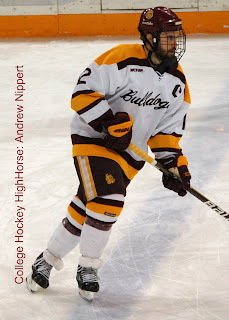 Duluth's attention to detail on the penalty kill continues to be the Bulldog's kryptonite. If there is one thing that keeps the Bulldog's from having a deep run in the playoffs, it will be the poor penalty kill (Craig interjection: and likely their power play too!). Hopefully the players will get back to the basics: filling the lanes; moving their feet and blocking shots. Colorado College at Minnesota – Duluth: The Bulldogs are coming off a disappointing 3 point weekend in Mankato after blowing a 2-point third period lead in Saturday's game and the Tigers split with UNO in Colorado Springs. The Tigers have been consistently inconsistent all season and I don't think that will change with a trip to AMSOIL Arena. If JT Brown was a lock to play this weekend I would pick UMD to sweep, but as his status is still unclear I will go with a split. Wisconsin at Bemidji State: The Badgers go back on the road, a place that has not been kind to the them this season. The Beavers are coming off a disappointing road trip to Minneapolis where they were swept in two games. I am going with a split, but would not be surprised if Bemidji got a sweep at home. North Dakota at Denver: This a big series for these two teams. A sweep by UND would put them a point ahead of Denver and a sweep by Denver could put them in a tie with the Gophers if they were to get swept this weekend. This should be two really good games that will result in a split series. Saint Cloud State at Michigan Tech: These two Huskies teams are only separated by 1 point for 7th and 8th place in the conference standing making this a very important series for both teams. The Huskies of Saint Cloud had a disappointing loss on Friday night be bounced back Saturday with a 8 goal explosion. Tech managed to salvage 1 point in North Dakota with tie in Saturday night’s game. These two teams should be evenly matched and it should be a split series. Minnesota – Twin Cities at Nebraska – Omaha: The Gopher's had a great weekend in Minneapolis defeating the Beavers and UNO split with the Tigers at CC. The red Mavericks have been a tough team to pick correct all season, but I think it is safe and correct to pick them for a split at home against the Gophers. Alaska – Anchorage and Alaska (home and home): This home and home series is always a couple of good hockey games and I don't think the home ice will matter much in deciding the winner this year. The bigger question for the weekend matchup is if the Seawolves figured something out after getting a couple wins in recent weeks against the Bulldogs and Huskies or are they still the same old Seawolves that saw an "8" go on the scoreboard for the Huskies last Saturday. I think it is the later. The Nanooks have beaten some good teams this year and will come away with the Governor's Cup after sweeping the Seawolves.